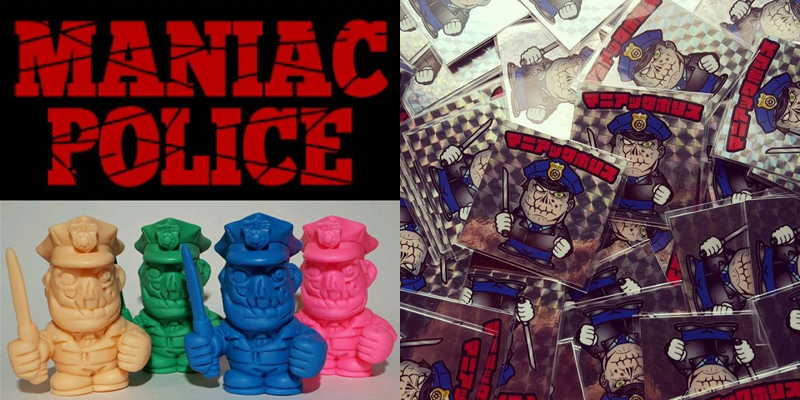 Teased here just a few weeks back, we can now reveal the third Splatter Retsuden keshi from Kotobuki Man’s Uncut imprint in-full, proudly presenting the Maniac Police! Inspired by cult horror flick Maniac Cop’s lead protagonist, the Bikkuriman-style keshi appears to be the same size as the previously released SP figures (Boropushi/Mush-Man), coming in at around 2.5″. Set to make its debut alongside a companion holographic sticker at Superfestival 69 next Sunday, September 27th, a choice of flesh, green, blue and pink colorways will be up for grabs at around 2,500yen ($20) each… Here’s hoping for an international release soon after! This entry was posted on September 21, 2015 by trutek. It was filed under cult films, horror, keshi, mini figures and was tagged with cult horror, horror toys, keshi, kotobuki man, maniac cop, maniac police, mini figures, splatter retsuden, uncut.